Bramblewood Cottage Guest House is situated opposite Fitz Park which offers clay and grass tennis courts, bowls, putting, excellent cricket club and play area for children. There is an indoor swimming pool/ leisure club to the rear of the park. Children welcome from age 7. Bramblewood Cottage Guest House sometimes limits bookings to 5 or more days. Newly refurbished, spacious bath and shower en suite, first floor, one king size bedded room with 2 comfortable chairs at the back of the house. Tastefully decorated and furnished to a high standard, colour TV, radio alarm clock, hair dryer, tea/coffee tray, wine glasses and USB socket. This room doesn't overlook the park. Room 3 sometimes limits bookings to 5 or more days. First floor double room, shower en-suite, 1 double bed. 2 comfortable chairs. The room overlooks the River Greta, Fitz Park and Skiddaw. 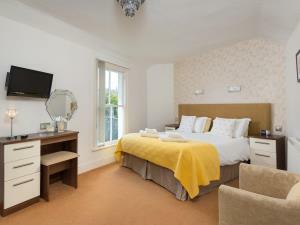 Tastefully furnished to a high standard with colour TV, radio alarm clock, hairdryer, tea/coffee tray and wine glasses. Room 5 sometimes limits bookings to 5 or more days. From M6 jct 40 take A66 for 17 miles to Keswick. Take first Keswick turning and turn left at junction signposted Keswick. On left, pass Twa Dogs Inn, petrol station, ambulance station and conservative club. Turn left after club into Greta Street. We are situated on the corner. Very friendly and helpful hosts. Extremely comfortable and well equipped room. Firm bed. Single room available for our adult daughter. 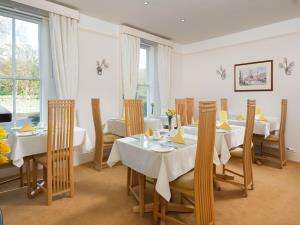 Top quality breakfast with lots of choice in spacious dining room overlooking park and fells Parking adjacent. Walking distance from all Keswick attractions with park immediately opposite. Views to Skiddaw from rooms at front. A wonderful place to stay for the Keswick Film Festival.